Twice in the last week I have had Bank of American credit or debit cards that have had to be replaced due to (accord to BofA) data breaches at merchants. I (and I assume most others) find these episodes annoying, not the least because I can expect a month or so of warnings and notices from merchants, hosting companies, cable companies, etc that my automatic payment did not go through and I need to immediately tell them my new card number. So in each case I asked Bank of America to tell me which merchant lost my credit card data. I don't think this is an unreasonable request -- if a merchant through some sort of data carelessness causes me a bunch of hassle, and endangers my financial privacy, I would like to know who it was so I can consider shifting my business to someone else. But Bank of America will not tell me. I think Target initiated a lot of reforms when they suffered through the public backlash from their data breach a while back -- while many merchants have their chip card readers turned off, you can bet they are not turned off at Target. Kevin Drum and the left think falling savings rates are all ... wait for it you are going to be shocked with surprise ... Reagan's fault. OK, you are not surprised, since in left-world everything that is not Bush's fault is either Reagan's, Wal-mart's or Exxon's. But I'd point to two other things that Krugman mentions: financial deregulation and stagnant median wages. Those seem like much more likely villains to me. Starting in the late 70s, middle class wages flattened out, which meant there was only one way for most people to support the increasing prosperity they had long been accustomed to: borrowing. At the same time, financial deregulation unleashed an industry that marketed itself ever more aggressively on all fronts: credit cards, debit cards, payday loans, day trading, funky home mortgage loans, and more. It was a match made in hell: a culture that suddenly glorified debt; an easy money policy from the Fed that made it available; a predatory financial industry that promoted it; and middle-class workers who dived in to the deep end without ever quite knowing why they were doing it.So, yeah, Reagan did it. Sort of. But he had plenty of help. The chart on the left starts out at 8%. Drum picked a recession peak as his starting point, a clever trick, but it appears that when Bush 1 left office the number was still about 8%. The largest fall seems to be in the Clinton years. For which, by the way, I don't "blame" Clinton any more than Reagan, certainly not without any real evidence or understanding of the mechanism involved. Drum's "consumers are all stupid pawns of electronics retailers and credit card companies" wears thin at some point. It's funny how everyone thinks this is true... of everyone else, but not himself. Let me posit an alternative. The 1980s and 1990s saw huge percentage increases in asset values, both equities and homes. This began just about at the time the savings rate dipped. I would posit that consumers, in their mental calculation of savings, included paper gains on these assets. These paper gains are not, to my knowledge, included in savings rate numbers (you can be sure that is true because, if they were, savings rates would have dropped in late 2008). 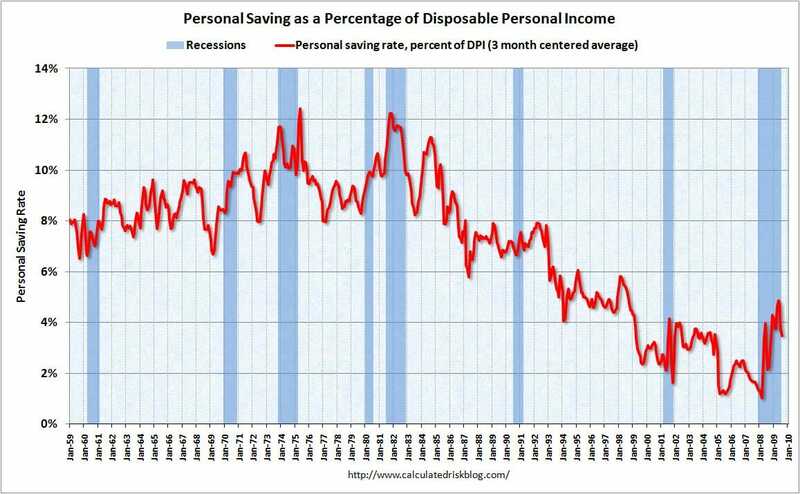 Thus consumers saved less money from their paycheck (which is measured, so it showed a drop in savings rate) while they considered themselves still to be saving as much or more as previously, because they were counting paper profits on assets as savings. The big decreases coincide with the 80's bull market, the 90's bull market / internet bubble, and this decades housing bubble. My explanation in number three will look even better if we see an increase in savings rate over the coming years as consumer expectations about asset value changes are made less exuberant by the recent burst bubble. A fascinating chart would be to plot savings rate against some measure of consumer expectations of future asset price increases. I bet they would correlate pretty well. Wow, the NY Times almost fooled me with this chart. Yet again they play games with scale and timeframes to make a point that is not correct. For example, it looks like overdraft fees may have risen faster than transactions, but that is because the overdraft fee revenue chart goes back to 1992 and the transaction chart only goes back to 2000. 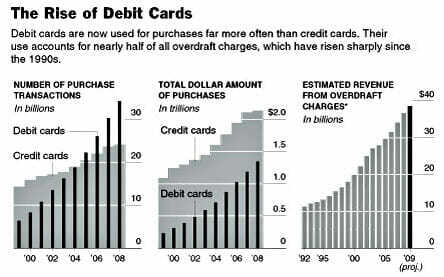 If we look at both from 2000, we see overdraft fees on debit cards have gone from $20 billion to $38 billion today, or about a 90% increase. At the same time, dollar amount of purchases on debit cards went from $0.3 trillion to $1.3 trillion (as well as I can read the graph) or an increase of 333%. I understand that there may be a mix shift I am missing - the overdraft numbers include charges for checks as well as NSF fees, but the article does not have the changing mix. This is another topic, but why can't reporters even at the Times include all the numbers you really need to analyze this stuff - don't they try to do these calculations? They have graphs side by side, implying one should compare trends, but they have apples (debit card transaction volume) next to oranges (all overdraft charges, including debit cards but other stuff too) on completely different time scales. Anyway, by the article's own numbers, the overdraft fee volume has grown 3.5 times slower than transactions, meaning that overdraft fees have dropped from 6.7% to 2.9% of debit card transactions. This shift may be less dramatic if there are mix changes in the fees, but never-the-less, why isn't this good news? The world is never going to make the price of carelessness=0, if for no other reason that the moral hazard would be so large. But the high price on carelessness in this case seems to be reducing the frequency of people being careless (if the price of an overdraft has really gone up as implied anecdotally in the story, then the frequency must be way down -- sure missed that data in the article). We want to raise the price of Co2 to produce less of it - why don't we applaud when we raise the price of carelessness and we get less of it?